Your logo, image or text on custom 3D chocolate is an eye-catching innovation in personal branding and promotional products for events, hospitality, conventions, licensing, and retail industries. Las Vegas, NV, January 28, 2018 --(PR.com)-- Chocolate is the new canvas in the world of food technology. 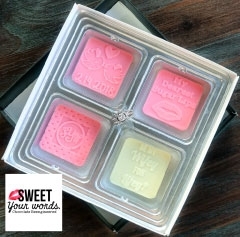 Sweet Your Words launches a revolution in branding and promotional products by creating the first and only 100% customizable chocolates on the market through the use of 3D printing technology. Beyond your choice of milk, dark or white chocolate, the creative team at Sweet Your Words has elevated the basic aesthetic of chocolate through a line of colored white chocolate options. Aptly called “Spectrum Series,” all of your chocolate needs can be created in Rose, Lavender, Peach, Sky, Buttercup, Lime or Aqua. Sweet Your Words also offers metallic finishes and edible glitter effects to keep ahead of upcoming trends and adding a modern twist. “With the inundation of beautiful images across social media platforms, it was important to us that our products jump off the screen,” said co-founder Erica Diamond, a veteran in the hospitality and baking industries. From custom wedding favors and dessert decorations, to inventive convention giveaways and platforms for licensed products, the applications are endless. Customers will receive unlimited design consultations and will not incur any setup fees that typically come with ordering custom tooled products. The team at Sweet Your Words is currently taking pre-orders in preparation for a March 2018 ship-out date. Sweet Your Words, Inc. is a Las Vegas based 3D chocolate company that brings innovative 3D technology to the chocolate and confections industry. Launching in March 2018, Sweet Your Words will invent a new way to design and manufacture custom chocolate pieces through the use of 3D printing technology. With an ability to execute computer generated or hand drawn designs, logos, and text, each piece of premium quality chocolate is unique. Click here to view the list of recent Press Releases from Sweet Your words Inc.